I would like to point out one important thing here that if you are adding / creating a new page in your project / solution, if you plan to upgrade your nopCommerce version, you will have to add the custom page once again in your solution. Another good approach to keeping yourself away from this extra work of adding custom page again and again in every new version is to create a plugin and add your new page in form of a plugin to that you can simply install the plugin in your solution - Hence, you won't have to write the custom code for your custom page again and again. But, since we are focusing on adding a new page in nopCommerce in this particular article, I will focus on that process / steps specifically. 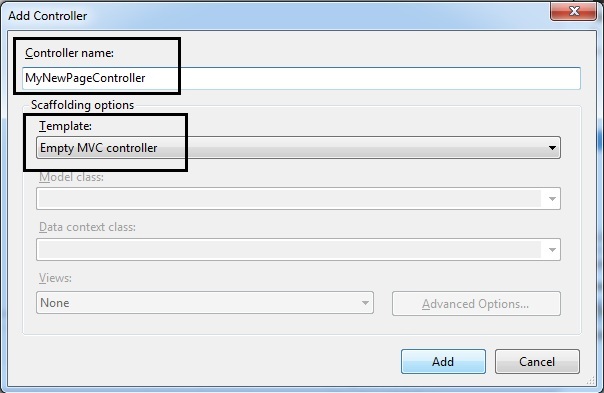 Step 3) Now, right click the "Controllers" folder > Select "Add" > Select "Controller.."
Step 4) Name the controller: I am naming it by changing the controller name from "Default1Controller" to "MyNewPageController"
In the Scaffolding options, make sure you have selected "Empty controller"
Step 6) In the left side (code): Right click on the Public ActionResult Index( ) line and select "Add View..."
The only box on this window that should be checked will be "Use a layout or master page:"
So, you might get error something like "Page not found" or "you typed the URL directly". No need to panic ! Now, you should see a page with the layout that you chose and in the content it should say "Index"
Now you can add your custom content/code in this page or you can create a topic and add topic section in the page so that you can maintain from the administration side easily. Lavish kumar, it was a very detailed resource! Thank you for this good tutorial. I am new to NopCommerce and this article helped me a lot. One question though, why do you think I will lose the new custom page when upgrade NopCommerce? isn't it just like updating nopcommerce dll references in Nop.Web folder without missing up with other folders? Thanks for your detailed explaination. Hi Karthick, look for ProductSpecifications.chtml in Catalog folder of your active theme. If its not in your theme, then you can copy it from default View folder of the nopCommerce to your theme and modify it as you require. Thanks for this tutorial. It was very helpful for a novice CSharp programmer. 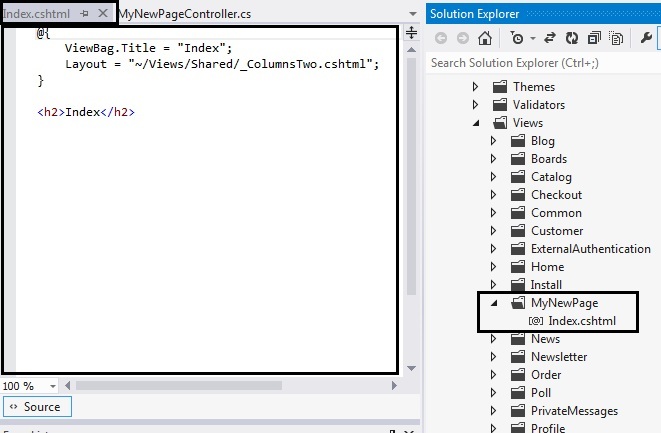 I'm not sure I understand your description of the parameter in this statement "In routes.MapLocalizedRoute("ThisIsMyNewPage", "MyNewPage", = "MyNewPage" is the name of your View folder"
the View folder should be "newproducts". I do not see a "newproducts View folder. You can always save the code for your custom page and try to add the same page code in your new upgraded version and it might work. There is NO guarantee that it will work because nopCommerce is constantly updated in regard to make improvements and so there could be minor changes in the structure of the nopCommerce architecture. This might make your custom page unusable as it won't be following the new updated structure / architecture. 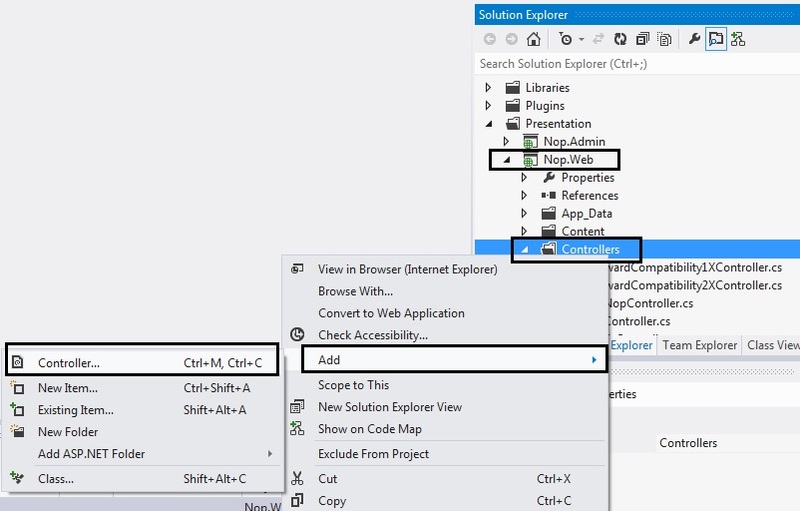 For example: What I mentioned above in the article in Step 10 and Step 11 was never a required step when nopCommerce 2.X MVC version was released but now these steps are required in order to make your custom page work. So, you can always save your custom page and try adding it in your upgraded version and see if it works. It might work and if it doesn't then you can always tweak by looking at other pages what pattern they are following and customize your custom page code in the same order to make it work. In my article I also mentioned about plugin which is an alternative to adding custom page that you can try: "Another good approach to keeping yourself away from this extra work of adding custom page again and again in every new version is to create a plugin and add your new page in form of a plugin to that you can simply install the plugin in your solution - Hence, you won't have to write the custom code for your custom page again and again." a good guide. Can you make a guide to add a data table? Which classes that are important and how to proceed. Thank you for the excellent tutorial... I'm fortunate to have landed on your blog since it is very hard to find good tutorials/documentation for nopCommerce. I'm thinking that in my case (hopefully) there are a few extra steps to make this work... I need to create a custom page for a website that was setup without the source code. Good content. Thanks. I want to learn how to build a plugin for nopcommerce 3.20 can you tell how? And if yes how much? Please send me e-mail. I'm disappointed that I never got an answer to my question. To answer your question, the example that I gave in the above tutorial is just a sample page. You can have different name for your view folder other than "MyNewPage". The best way to understand this is to add several test pages in your nopCommerce project with different names and you will know how it works. Thank you for your feedback. I understand what you are trying to accomplish as you used web version to publish your website. Any kind of modification (including add a new page like this tutorial) requires source code. So, yes you will need to download the source code of the version you are using for your website. All you have to do is to just follow the above steps to add a new page in the source code version, rebuilt / recompile the solution - Then add then update the view folder and bin folder on your server and you should be able to see the addition on your live site. If you have any question, please feel free to get back to me. Thanks Lavish for your answer, I will take a look in this tutorial. Thank you for your tutorial. It's excellent and much needed. Please could you help me with one problem though. I have carried out all the steps that you have listed but I am still getting the 'Page not found' error message whenever I try to view the page. Also, I noticed that you have step 9 missing. Is that a numerical error or has there been an actual step that has been left out? Thank you and once again I appreciate the effort you put into this article. Hello Irfan, thank you for your feedback and pointing out the type in the steps. It was just a typo in numbering the steps which I have corrected. There is no missing step in the tutorial. Thank you very much for your very quick response. I still can't see the problem in what I have done. Below is an explanation of the steps and the code that was produced when I followed your tutorial. 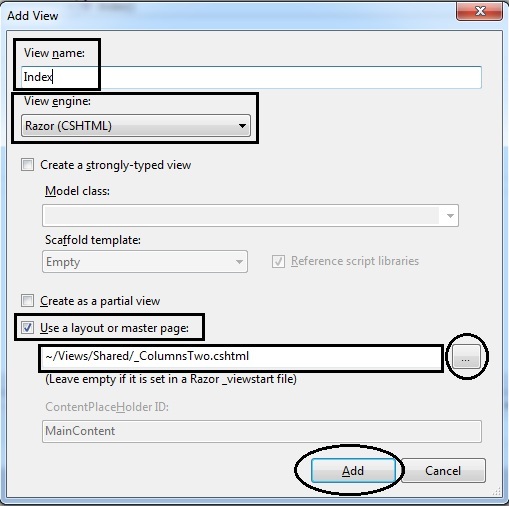 I then created the View in the Nop.Web/Views folder. This resulted in the creation of the following folder Nop.Web/Views/Repeat. A file called 'Index.cshtml' file was also created at the same time. I then rebuilt the entire solution and hit F5. So far, I can't see anything wrong in what I have done. Please could you have a look to see if I have made a silly mistake. First problem, I see is t he way you created / named your controller. If you read the step# 4 & step#5 above, you will see how the controller should be named and how the code looks like. When you add new controller, it gives you a default name as ""Default1Controller" - If you carefully read the step#4, you will see, you are not supposed to replace the "Default1Controller" to "Repeat". You are only supposed to name keep the "Controller" and add your new page name before it. In your case, it should be "RepeatController". 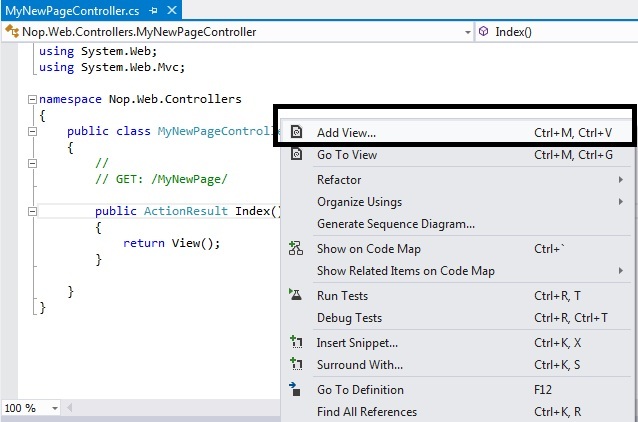 In your code, you have "public class Repeat : Controller" - It should be "public class RepeatController : Controller"
Second problem, I see is the way you linked your Layout to your "Repeat View page"
Make sure you have "~" in the path. I would suggest to create a new page and follow the steps. As long as you follow the steps correctly, your new page should work. Thank you very much for this. I placed the Tilda sign at the beginning but I think your blog removed the character when I posted it. I also looked at the RepeatController word and you are correct. That was where I made my mistake. I corrected this and it works perfectly now. Once again, I have to thank you very much for your help and not just that, the quick responses too. It's very much appreciated. You're Welcome :) I am glad your problem has been resolved ! In which part of the code are mapped the routes stored in the urlrecords table? I cant find it. i.e. the route /book needs a controller BookController but as I cant find the file in the project I am assuming that it is mapped to somethingelse at some point. Many thanks. Please take a look at step# 9 and step# 10.
sorry for the confusion and many thanks for you prompt answer. appreciated. I have a question with regards to adding title and meta tags. How is this done when you create a page this way? 1) First go to admin section > Configuration > Languages > click "View string resources"
How does this affect the upgradability of NopCommerce? Would it be better to create a plugin project with the controllers, views, and models instead? Or do the benefits of having the new page's files in Nop.Web outweigh the hassle of loading up another plugin dynamically? It depends on your requirements. I personally think if a page does the job and you are not making complex customization in your custom new page then adding page is an easy way. Add you have to do is upgrade your nopCommerce version and add a new page then copy/paste the custom code from old page to new page - that's all. 1) Make sure the SupportVersions field in Description.txt in your custom plugin file matches your current or new nopCommerce version. So, as you can see steps involved in both case either adding pages or creating plugin when you upgrade your version of nopCommerce so it if completely your choice which route you want to go and what you are comfortable with. how to deploy on remote server ? Once you add the new page in your project, make sure to re-build your project. 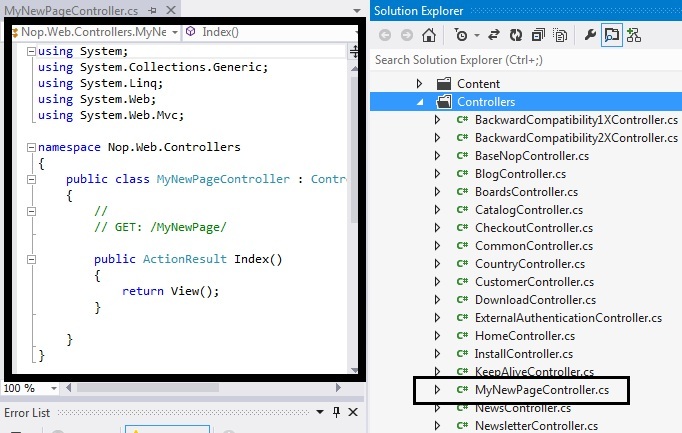 Then just update 3 things on your server: "bin folder", "new controller" & "new page in your view folder"
How does this affect the upgradability of NopCommerce?....Thank you for this good tutorial. For the update, please see my comment # 7 above. Just to give you an idea. You will have to create the page again in the newer version of nopCommerce if you decide to upgrade. You can use the same content for the page from the old version if you like. So, it is just a matter of copy and pasting the page content once you re-create the page in the new version. I am new to NopCommerce and this article helped me a lot. Web folder without missing up with other folders. Thank you for your comments - I am glad the article was helpful to you. I tried it step by step, as explained in your article. Trying to access it, "http://www.mywebsite.com/MyNewPage" end up in PageNotFound. PS: I use version 3.40. Did you follow the step# 9 & 10 mentioned in the above article? You must map the route so that solution can locate the new page. I tried again, but the result is the same: PageNotFound. Could you please mention all the steps that you took to create a page and please post name of your new page, complete page code (of new page) and route map code ? //We reordered our routes so the most used ones are on top. It can improve performance. 6) In NopCommerce Administration, I emptied the cache and I restarted the application. PS: I am using the 3.40 version. Ok so everything looks good but it seems like you only uploaded the new page view, controller and route file to your server. Please make sure you upload your "bin" folder to the server after you compile / re-build your project. Simply, take your "bin" folder from your development machine and upload it on your server. If it says, "bin" folder already exists on server - replace old one on server with the new "bin" folder. I tried again. Now, it works! But only locally. Why online is not working? I need to load some other file or folder? Hi lavish,...can u tell me how to add new page in nopcommerce 3.40. You can follow the same steps (as mentioned above) for nopCommerce 3.40 - Everything is pretty much same and there are no major changes. Let me know if you have any question or need any help. Could you please provide more details about what step# are you on (according to the above article)? or what exactly you are trying to accomplish so that I can help you with it? I want learn adding simple custom page in nopcommerce 3.40 ...but I am not getting those options which you have shown in above in your blog.Kindly explain in 3.40 with screenshots if possible. I do not have VS 2013 right now on this machine but I used Visual Studio 2012 for the article which is why you must be getting different options. I f you can post your screenshots, I can guide you with the process in regard to what needs to be selected. The overall process is still the same. @Bharathi Baskar.B, thank you for your comments / feedback! I tried to create a page which displays the registration form but it gives me an error. 1. Created the Reseller(This is what I'm calling my newly created page) page as mentioned in the above steps. Hello Hervemoha, can you please specify what error are you getting? Can you share screenshots? Also if possible, please specify steps that you followed in 3.60 version and I'll help you in troubleshooting the problem. I added a controller MyDeclineController and in views folder, I created a folder MyDecline and added Index.cshtml view. I have a Index method in my controller. When I rebuild the solution; It work just for few time and after I have message "Page not found". I followed exactly your procedure step by step. Hervemoha, I'll get back to you by the end of the day (today). Did you create "MyDecline" folder manually or it was created automatically when you added a view? Hervemoha, if you follow all the instructions step by step (mentioned in the article above), the view folder (MyDecline in your case) should be created automatically. In this case, what can I do? 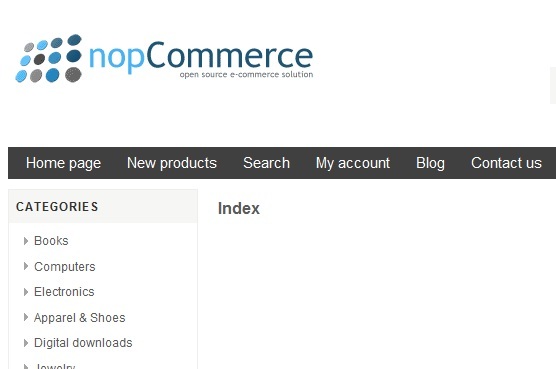 @Hervemoha, how about this - Give me some time (or days) and I'll write a brand new article for creating custom page in the latest version of nopCommerce (3.70). This is an excellent tutorial that works if your URL is simple. But apparently adding a simple underscore to a folder name causes the routing engine to fail silently (no 404 errors, it just redirects to the homepage). It is very frustrating... How do you fix this? I'm using NopCommerce v3.8, but your your article is not not working for custom page addition, it may be because article is on 3.1.